Gluten Free In Las Vegas! - Gluten Free In Las Vegas - Welcome! Welcome to "Gluten-Free In Las Vegas!" 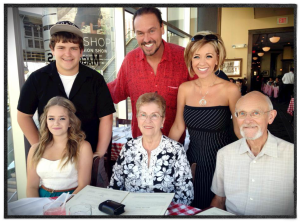 Thank you for visiting the Gluten-Free In Las Vegas website! The purpose of this site is to provide additional resources for those residing in (and visiting) Las Vegas who are living a gluten-free life. My name is Lisa Smith, I am a jazz singer here in Las Vegas (www.LisaSmithJazz.com), and I was diagnosed with Celiac Disease back in 2006. I am pictured here with my mom, Janet Rogers (who also has Celiac Disease...she was diagnosed in 1997) and the rest of my family. One of our VERY favorite things to do together has always been going out to eat...and we weren't about to let a little thing like Celiac Disease stand in our way. :) Especially in a city like Las Vegas! So part of this site will be our recommendations for truly GREAT RESTAURANTS where you can safely eat gluten-free here in Vegas! I am also learning how to cook gluten-free so I will also be adding some of my favorite gluten-free recipes periodically. In addition, there is information on the best places to shop for gluten-free items, as well as links to events around Las Vegas which may be of interest to you. Check back often, as this website is a work in progress. Please feel free to contact with us via the "Contact Us" page if you have any suggestions or comments, and connect with us on our FACEBOOK page, on INSTAGRAM, or on our TWITTER feed. We look forward to hearing from you!